This is one of my favorites. I make it all the time because it’s delicious, but also because it’s so easy to prepare. You probably have had butternut squash soup in the past, but this one, adapted to the Paleo lifestyle, is particularly interesting with its coconut milk base. It makes for a very rich and satisfying pureed soup. It’s so filling that it can be taken as a meal on its own. Winter squashes like butternut squash or spaghetti squash usually keep for a long time, so you can buy them in advance and use them when you don’t know what to make for dinner. 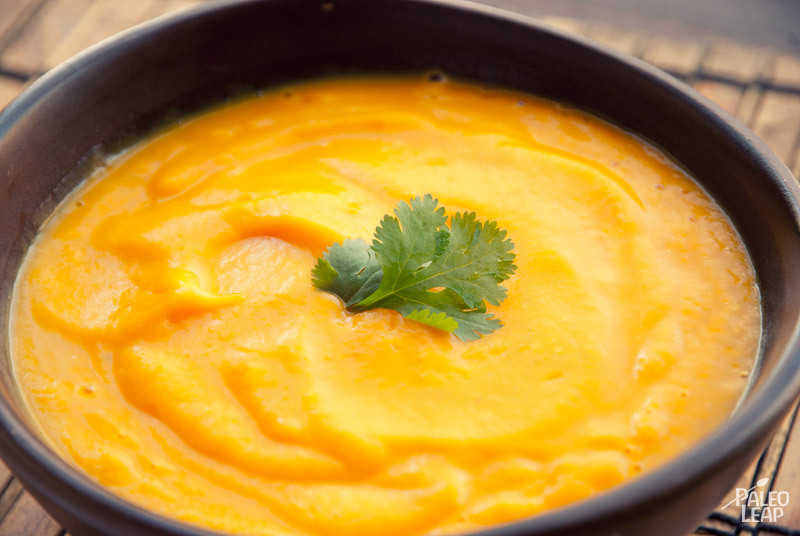 Did you know that in one 200g portion of butternut squash, you get more than 450% of the recommended daily intake of Vitamin A in the form of Beta-carotene. Taking too much vitamin A can be dangerous because it’s a fat soluble vitamin and the body has a hard time getting rid of excess. However, beta-carotene is the precursor to Vitamin A and doesn’t cause such a problem. Too much of it could cause carotenodermia, a benign situation where your skin turns orange. The lesson to keep: Vitamin A is a vital nutrient, eat butternut squash or carrots freely to get it and eat liver once in a while, not every day (liver is very high in true Vitamin A). It’s also interesting to know that the liver of some animals are so high in Vitamin A that they are toxic to humans. Polar bear and husky dogs are two examples. New settlers learned that the hard way when they came to North America. Cut your squash lengthwise and remove the seeds. You can get rid of the seeds or keep them and roast them for a snack latter. Place the halves, cut side down, on a baking sheet and place in the oven for about 45 minutes. It might take longer, but I suggest you check on them after 45 minutes. Verify that the flesh is fork tender and it’s ready. Now either wait for the squash to cool down a bit so it’s easier to handle or put on some gloves. Scoop out the cooked flesh in a sauce pan and add about 3/4 of a can of coconut milk per squash. Start mashing the squash with a potato masher on a low heat. Note that you can also place the flesh and coconut milk in a blender and blend the mixture. I prefer the version in the pan, less work than washing a blender. Once everything is mashed up, adjust the consistency by adding some coconut milk if needed. Season with salt and pepper to taste. If you want to go fancy, grate a bit of fresh nutmeg . You can also add some grated fresh ginger or garlic for a nice spin on the taste. Serve and enjoy! Garnish with fresh herbs on top if you have any. For added style, you can drizzle additional coconut milk in a spiral on the served bowls to create a white swirl.